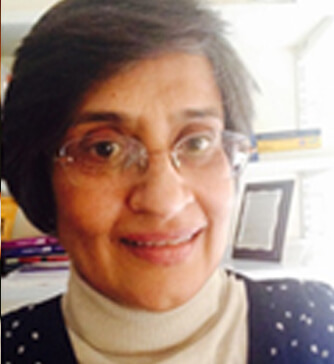 Dr. Nandini Shetty qualified from St. John’s Medical College & Hospital, Bangalore, India in 1979. After 3 years as an anesthetist she chose to specialise in Clinical Microbiology in 1983, obtaining an MD in 1987, the MRCPath in 1994 and FRCPath in 2003. In 1999 she obtained the Diploma in Hospital Infection Control (DipHIC) from University of London; and in 2004 she completed the MSc in Epidemiology and Statistics also from University of London. Nandini has experience in the practice of clinical microbiology and infection control both in India and in the UK. In 1998 she was appointed consultant microbiologist working jointly for the NHS and Public Health England (PHE). At PHE, Nandini is the Clinical Services Lead for the Bacteriology Reference Department; her portfolio also includes leadership of post-graduate medical training in PHE and clinical governance in PHE’s Reference Microbiology Services. She is an examiner and question setter for the Royal College of Pathologists and has been instrumental in crafting the new Microbiology / Infectious diseases curriculum for specialist training. She is the UK’s deputy focal point for Microbiology at the European Centre for Disease Prevention and Control (ECDC) and an expert on antimicrobial resistance and stewardship at WHO.